CUBA STANDARD — A Fort Lauderdale-based startup company announced it is offering text messaging service between the United States and Cuba. 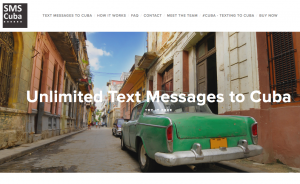 SMS Cuba said its service allows users phone-to-phone, two-way texting with their contacts in Cuba. Under its new Cuba policy, the Obama Administration is encouraging telecom services to Cuba and Cubans. Text messaging has become a way of life for the nearly 2.5 million Cubans with cell phones who cannot afford expensive calls. According to SMS Cuba, no text message service was available between the United States and Cuba from any U.S.-based wireless carrier. U.S.-based Skype users have been able to send text messages to Cuban cell phones. SMS Cuba offers monthly plans ranging from $2.95 for one contact and up to 30 texts to $9.95 for five contacts and unlimited messages. Skype charges 9.7 cents per text; if a customer sends more than 50 texts a month, SMS Cuba’s unlimited plans will be cheaper, says Jennifer Leach, co-founder of SMS Cuba. A serial entrepreneur in the telecom industry, Caruso has founded a half-dozen companies, including USA Datanet, a VoIP and Internet Service Provider. This entry was posted on Friday, May 8th, 2015 at 4:11 pm	and is filed under Companies. You can follow any responses to this entry through the RSS 2.0 feed. Both comments and pings are currently closed.